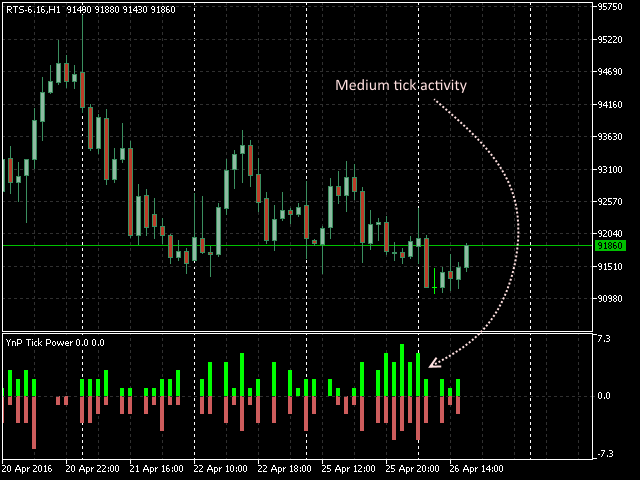 The indicator displays a histogram of tick activity. Tick Power considers the number of ticks received over the selected short time intervals, and also their direction. Thus, the indicator displays the current prevalent sentiment of the market and also allows to use the spikes of tick activity. As this indicator is not based on the analysis of candlesticks but on receiving data from ticks in real time - it will not work in the strategy tester correctly. 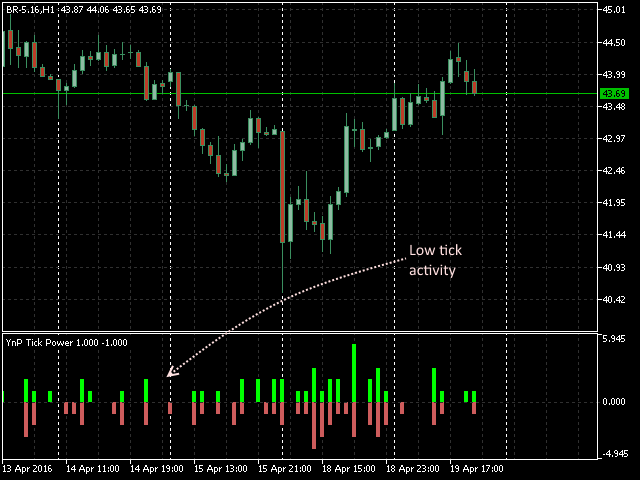 The indicator is most useful when combined with the YnP Price Power MT5. Both indicators allows to use the spikes of market activity for scalping and receiving information on market and notifying about major market changes. This version is designed for the MetaTrader 5. The version for MetaTrader 4 can be found here. Price Mode - price mode. This parameter sets the price to plot the tick histogram. The Bid price is used by default. Period - histogram width (in seconds). Selection of the time period to display the ticks. By default, the histogram shows the ticks for the last 3 seconds. Precision - histogram accuracy (in bars). Selection of the number of segments to divide the time period of the histogram. By default, the histogram is divided into 120 parts, i.e. one bar shows the number of ticks for 0,025 seconds.